We've already covered how to launch a Facebook page, what to post, and how to advertise your social media pages. Today we're covering photo albums on Facebook. Facebook photo albums are a great tool for showing off what you do best. If you've ever used Facebook on the personal side, you've probably noticed how easy it is to flip through a large number of photos. For example, if your friend posts 200 pictures from their trip to Italy, you can get through them in about ten minutes using the right and left arrows on the keyboard. If you are engaging existing patients and customers and attracting their friends and curious local consumers through giveaways and any publicity your page garners, then posting a photo album of your best Botox before/afters is a non-obtrusive way of showing off what you do best. Although it is easy to simply throw up the same pictures that you have on your website, Facebook gives you the ability to write little captions below the pictures, with photo-tags where you can highlight areas. This is not an annoyance, but an opportunity. As you can see below, this sample before/after has a detailed note that casual consumers can appreciate, as well as a link to your website and your phone number. This puts you above your competitors, most of whom simply have an assistant slap up a bunch of pictures without explaining what the procedure is. 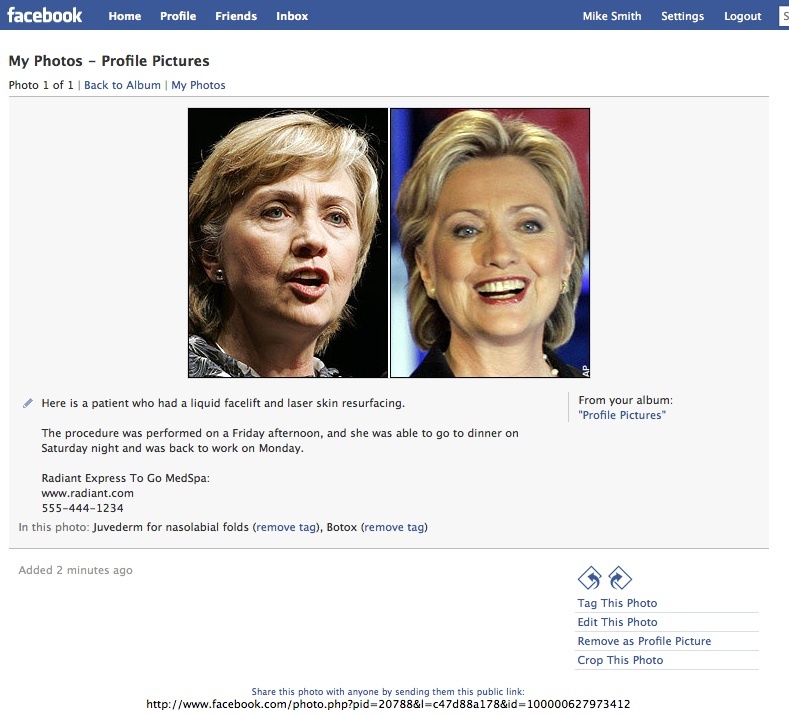 An unfounded concern of many medical spas is the photo authorization needed to put photos on Facebook. If your patient signs a waiver that authorizes you to put their photo on your website, that also applies to Facebook, so no worries there. You can mass-upload albums of before/after albums with your comments. Another idea is fun is to organize things chronologically, and have albums like "March 2010 Botox." This builds up trust with consumers, who know you aren't just cherrypicking your best results from ten years ago, but are routinely getting great results. You should also have an album of staff in action, like a facial, massage, or the receptionist smiling warmly by the front door. If you do events, have a photo album for each event showing how informative and fun it was. If you're a guest on the local tv morning talk show, get a picture with the host and post it.